Armello is a game that has a lot going for it on paper; a deep yet understandable card-based board game mechanic, cute anthropomorphic avatars that murder one another, differentiated strategy elements and a beautiful opening cinematic. Sure, that list seems pretty intriguing and for a while Armello was a game I kept a close eye on. When Sony allowed players to vote between three PlayStation Network games, the winner being free for a month, I voted for Armello. The sheer concept of a well-made digital board game brought back memories of Settlers of Catan on the Xbox 360. Unfortunately, Armello is never able to get out of its own way and really differentiate itself among the countless board games that already exist. 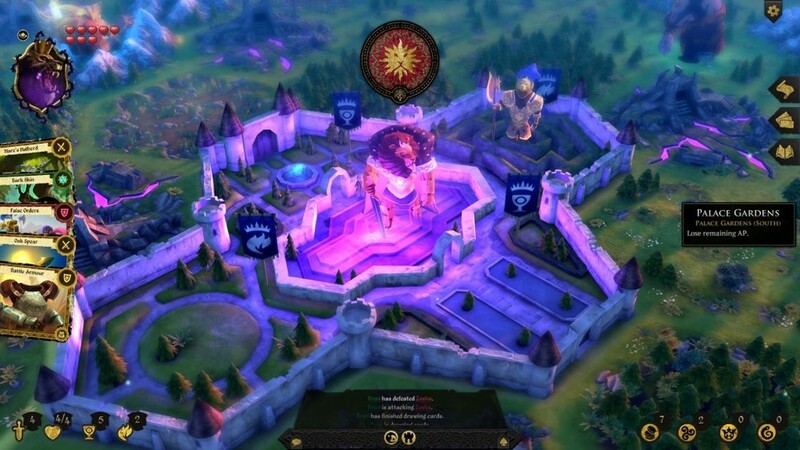 The world of Armello is in turmoil as its king, the regal lion, is suffering from “The Rot”. Rot is a vile plague that, when severe enough, corrupts its host into a cruel and dark creature. After realizing that the king isn’t acting like himself, the heroes of Armello find out about his rot issue and decide to take matters into their own hands. That means ridding the kingdom of their diseased king, or possibly saving his life. 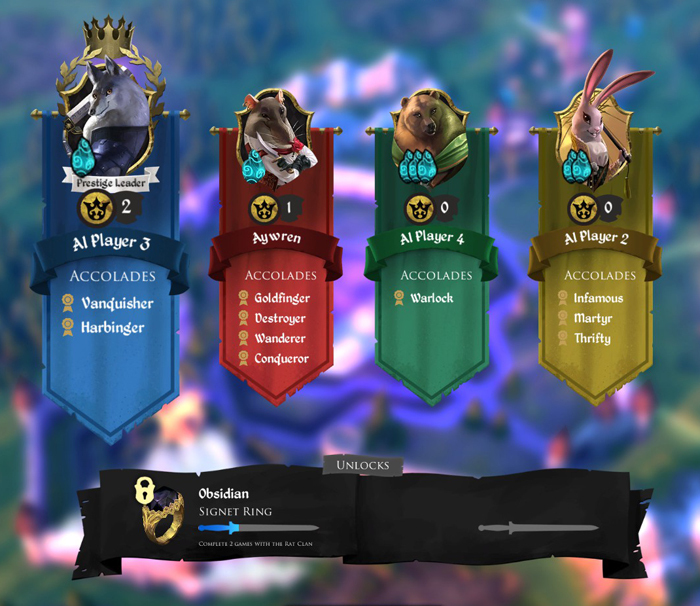 Armello takes the form of a turn-based board game that revolves around your character’s unique abilities as well as the hand of cards you have. The game operates on a day to night cycle with each day leading to new cards to draw and each night bringing new terrors to deal with. The objective is to remove the rotten king from his throne and each day he loses one health while each night he gains one rot. Players take the role of one of eight playable characters from various factions across the land. Fearsome wolves, spiritual bears, tricky rats and quick-witted rabbits form the character base of the heroes with each character having separate stats that relate to health, fighting ability, magic and wit. Each of the attributes are used to complete various tasks, everything from fighting other players or enemies to seeking out treasure or other prizes. After picking a character, you’re dumped into the world with three other players, either CPU or player-controlled, and your objective it to kill or save the king. 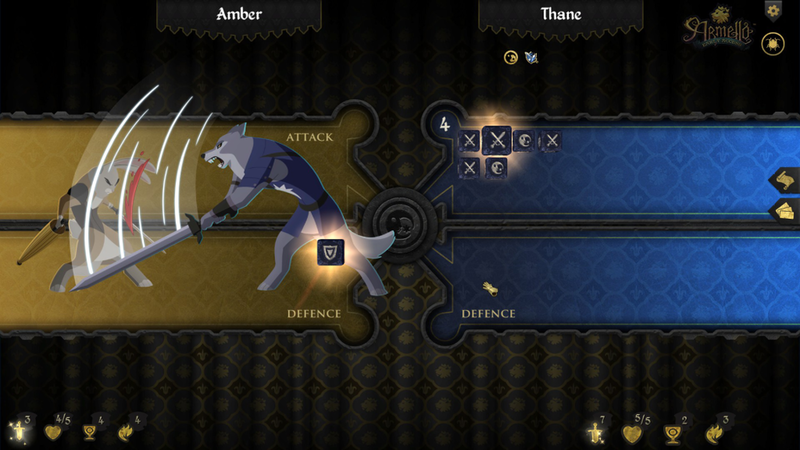 Winning Armello isn’t as simple as being the one to slay the king. There are four methods of victory and each has a style of play that goes with it. The first is being the player with the most prestige at the time of the king’s death, earned through completing quests or killing players or enemies. You can also kill the king and have more rot than the king at the time of his death. Rot is accumulated through various perils and fights, as well as being killed by Banes that appear at night, so going the dark route takes some effort. A third option is to run around the map collecting four spirit stones to cure the king of his rot, an objective I found to be the hardest to complete. The fourth option is to kill the king directly and survive, a difficult process due to his high attack rate. Once any of those four options are completed the game is over and a victor, and new king, is crowned. These games typically last about an hour from what I’ve seen and each victory type is possible though the prestige victory seems to be the most accomplished one. The issue there is that there are variable ways to win but many players, in my experience, go for the one that’s easiest. It’s far too difficult to accumulate rot quickly if you don’t get the cards and circumstances just as it’s hard to make it around the map and collect four spirit stones that spawn in random, often far-off locations or are rewarded as quest items. This makes the game feel like it’s not beneficial to try and win any other way than prestige-based, hampering the experimentation that seems to be there. That same logic applies to Armello’s characters as far too often I found that the character with the highest health and attack was the easiest to win with. Thane, the male wolf character, has high attack and health and was the character that won the majority of the games I played. That’s because it’s easy to hunt down players with Thane, using his attributes to defeat players in battle, ensuring you gain a prestige point for each kill and players lose a prestige point for each death. Doing this keeps the players in a bit of a rut as they can’t dig out of their prestige deficit quickly enough before Thane goes off to kill the king himself or waits out the number of turns for the king to die. Sure, players can try to gang up on Thane but too often I found it difficult to find players online, leaving me to deal with the subpar AI the game has for CPU games. The online community, at least during my time with the game, seemed to be lacking so I was left to fend for myself with the CPU quite often. The CPU in Armello makes a lot of questionable decisions that are things players would just never do. Moments of CPU confusion included spreading a plague and then killing themselves with said plague even though the area was avoidable, issuing a cease-fire between players with a -3 prestige penalty for fighting and then immediately fighting, and other strange, head-scratching moments. It’s one thing to have AI that plays the game at a basic level, it’s another to have AI that doesn’t seem to really understand how to play the game in the first place. Perhaps the AI is just too advanced for me as Armello does have a lot of systems rolling around it the game. Armello’s systems can be overwhelming for a new player. Thankfully, the game does a fairly good job of introducing new players to these systems via a lengthy tutorial. Combat is done via a dice-rolling mini-game where cards in your hand can be “burned” for their corresponding symbols, granting extra swords or shields to fight or defend with. This system is one of the more straight forward systems and is simple to grasp once seen in motion. The rot system is also fairly easy to grasp as a character with rot gets additional dice for each point of rot that it has more than the character its fighting. Certain characters are made to fight better against rotted characters with additional character-specific attributes and abilities but these never came into play in a major way. Unfortunately it's just not worth exploring all of the systems, attributes and abilities because the major flaw of Armello is that these interesting systems don't come into play often enough. Once in a while my character’s attribute helped me get the gold I needed or win a fight or two but overall the attributes are benign enough to not make a big deal between characters. Similar still is the fact that when these systems are removed, due to not being differentiating enough, the game feels very much like a standard, run-of-the-mill board game. When all of the interesting bits are mitigated and feel just surface-level you’re left with a board game that involves fighting, questing and killing one another. Armello has a lot of potential but the interesting bits never come to the forefront in any meaningful way, leading to a rather bland experience. But after a few too many deaths and dumb luck wins I felt put-off. There’s definitely a lot to like with Flywrench for fans of the insanely difficult, rapid-spawning games but for the more casual it will only offer a brief run through 170+ levels that will end in glorious victory, endless deaths, or sheer, dumb luck. The part I appreciate the most about the game is the presentation – while I wish it was easier to see what other characters had, something you’d be able to in a real board game without having to dive multiple menus deep, all of the cards are gorgeous. Card art always feels like it’s underappreciated, but they really shine here, in no small part to the animation on them.